Sometimes while shopping for that perfect piece, you find exactly what you are looking for, well almost exactly. If it were just a little different it would be perfect. Sometimes you don’t have to live with almost perfect. Many times, simple changes can transition a piece from close enough to just what you were looking for. When I first saw this piece at Hobby Lobby, I loved it. The mix of letters, the rustic farmhouse look, the simplicity, the size. Everything was perfect. 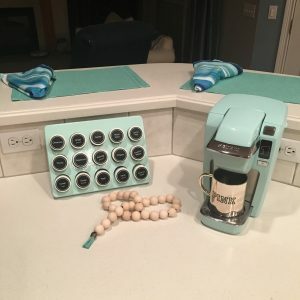 Well, everything except for the color of the N. I’m not a huge fan of pea soup green, but my problem wasn’t a particular dislike of the color, but more that this shade of green would clash with the turquoise accents in the rest of the hallway. I wanted to place this sign over the laundry room door and adjacent to my family command center. I didn’t buy the sign the first time I saw it. But I went back the next day and purchased it. 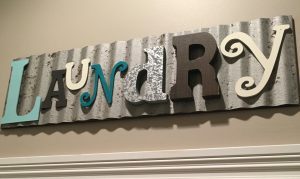 Using a sample of Valspar paint, I simply painted over the letter N. Now I love the sign and it fits perfectly with the rest of the decor. It would be just as easy to switch out any of the colors that don’t work perfectly for you. It would even be easy to change out the colors and make each letter a neutral if you prefer a monochrome look. Another example of a piece which needed a little change is these cute little vases. I purchased these from Bed, Bath, and Beyond years ago. They have had a few updates over the years. 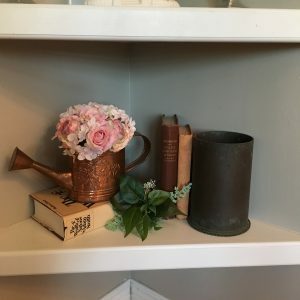 When working on updating the decor in my hallway, I took down the dark brown wall hangings where these vases have resided for the past few years. I knew I still loved the little vases and just had to find them a new home. It didn’t take long. 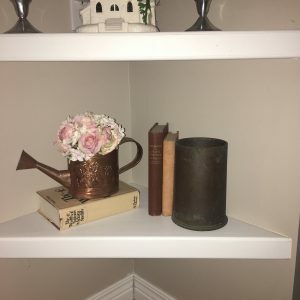 To fit with the rest of the decor in my family command center, these little vases would need another update. 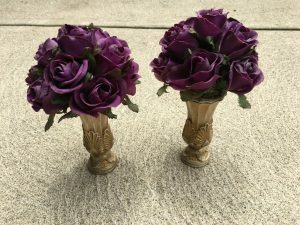 I took out the purple flowers and then spray pained the vases with this paint. 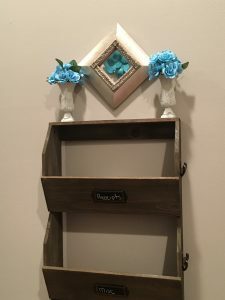 Next I purchased some turquoise flowers from Hobby Lobby and changed out the flowers, the steps to changing out the flowers will be added soon. Let me know if you have questions before then. I used fewer of the turquoise flowers than there had been of the purple because I now need the tiny vases to sit closer to the wall than before. 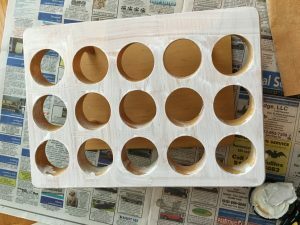 Another recent mini-update with major impact is this spice rack. I received this as a gift for my wedding shower years ago. 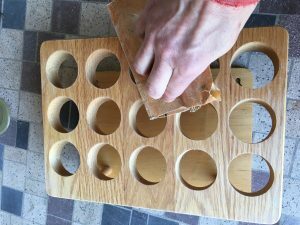 I still love the spice rack. The bottles are the perfect size for me. I love how it sits on the counter, and I love that it was a gift from a dear friend. However, the labels have faded and the color doesn’t fit with my current kitchen décor. 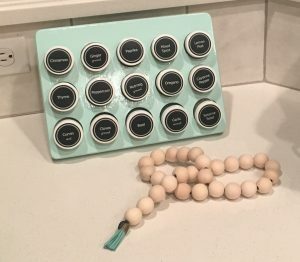 When my family gave me a Keruig in a beautiful seafoam shade my daughter chose, I knew instantly how I would update my spice rack. and used Rust-oleum in Gloss Ocean Mist to paint the wooden part of the spice rack. To prepare the surface we sanded it lightly and used a white primer. 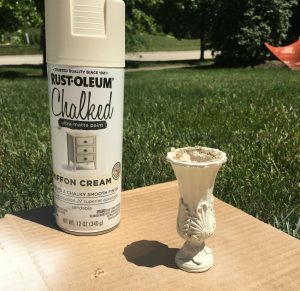 I don’t always user primer on my DIYs but on this project we sanded and used a primer just in case there was any remaining residue from being placed near the stove for years. Here’s a look at the finished product. One final mini-update was as simple as adding a small amount of greenery to this shelf. It didn’t need much to make a big impact. Even with the blush colored bouquet, the shelf still needed some softness. Don’t be afraid to make changes to pieces you own whether new or old. If a piece or vignette isn’t working for you, play around with it until you get it exactly right. And if you make a mistake or two along the way, that’s OK. Everyone has made mistakes. They are just part of the decorating process. Don’t be afraid to admit your mistake. Just because you thought you would love how something looks, if you really don’t love it when you are finished, try some small changes before you decide to settle! 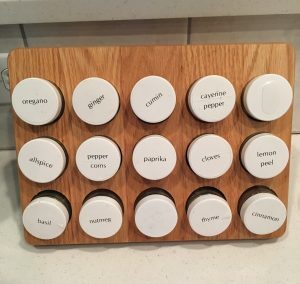 That spice rack hack is awesome! I need to remember this as I see something I’m about to get rid of — what could some paint do? Thanks!